By next spring, you will be able to buy Dainese's top-of-the-line Mugello D-Air race suit, with the company's self-contained airbag protection system, right off the rack and here in the United States. Without having to go through Dainese's custom fit program, you'll be able to wear the same protection enjoyed by MotoGP gods like Valentino Rossi and Andrea Iannone. The D-Air airbag system is little changed, but Dainese upgraded the Mugello R suit it lives in. Dainese photo. That's the good news. The news that may make you pause is the price: about $4,500. That's especially true because the airbag technology in the suit is little changed. The only change to the D-Air system is that the airbag now extends down the lats and around the ribs, extending the areas of coverage. Instead, Dainese has been at work on making the Mugello R suit itself as advanced as the D-Air system it contains. So what makes a suit (potentially) worth $4,500? Let's look at the details of the new Mugello R D-Air suit. We reported before on the D-Air system, which has been available in Europe for a few years but only lately came to the United States. The D-Air system uses electronics in the speed hump to sense a crash and inflates airbags in the suit in milliseconds to protect the rider. Previously, in the U.S. market, it was available in the Misano suit ($2,500) or the Mugello, but only through Dainese Custom Works. Now, the Mugello R D-Air will be available off the shelf. Dainese Mugello R D-Air suit. Dainese photo. The Mugello was already a step up from the Misano because it was made of kangaroo hide, instead of cowhide, which increased abrasion resistance and decreased weight, and the aluminum hard sliders were replaced with titanium for increased cool factor. For this revision, Dainese set out to improve the suit itself with some innovative materials and construction techniques. In doing so, they achieved five new patents. Titanium hard sliders are attached to the suit without being sewn in place with thread. Dainese photo. For example, Dainese redesigned the hard titanium plates on the shoulders, elbows and knees to be constructed without stitching. Why? Because with conventional techniques, one of two things happens under stress. You can use Kevlar thread, which is so strong it tears the leather, or you use something other than Kevlar and the thread holding the leather together fails. Dainese's solution was to eliminate the thread altogether. Unfortunately, Dainese has not revealed how they are attaching the sliders. But the byproduct of that, in addition to eliminating a weak point of stitching, is that it allowed them to think about ways to increase the knee comfort without sacrificing protection. The leather accordion panel, which typically resides above the knee, is now lower and over the top of the knee, for more comfort and mobility. Similarly, Dainese also introduced a new material to increase the comfort in high-flex areas, like the back of the knee and the crook of the elbow, where thicker materials can bunch up. You may say, “A little bunching up of stretch material can’t be that bad.” At your next track day or race, however, a little discomfort, restricted mobility or distraction that takes your attention away from focusing on what the bike is doing is going to result in slower lap times, at best, or contribute to a crash, at worst. Dainese improved on standard bi-axial stretch material with what they call Tri-Axial elastic. The thickness of the material varies within a single piece of fabric, so it is thinner in the zone where it could bunch up. Other companies have tried another approach to this problem by sewing a thinner piece of material into a thicker surrounding panel. In the end, this wasn't totally effective because the bulk of the seam offset the advantages. 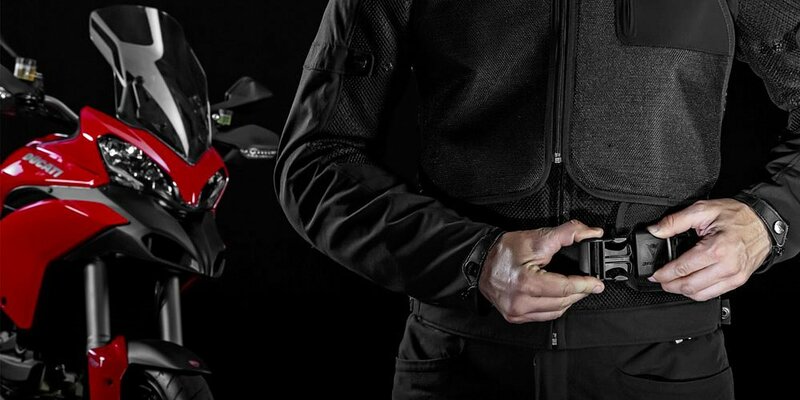 Sticking with construction, Dainese now uses a single panel of leather to construct the whole back of the suit. Take a look at the number of panels used to construct the back of a typical race suit. In general, the less expensive the suit, the more panels used to make it. Of course more panels mean more seams, which are a potential weak point. Also, by moving seams out of crash zones, Dainese found that they were able to eliminate the binding in the hip area that you sometimes get in a race tuck. The LED strip illuminates if the rider crashes. Dainese photo. Another unique feature built into this highly advanced piece of kit is what I like to call the ejector signal. It is an LED light strip across the back of the speed hump that is tied into the D-Air system and detects unique events (i.e., you’re about to crash) and turns the light on once you and the bike have become separated. This system is designed mainly for races in foul weather, where visibility is low. Overall, Dainese took their top-of-the-line suit and put it under the microscope to make sure the suit is as advanced as the tech it carries. Is it worth $4,500 to you? That's a question racers and track day riders will have to answer for themselves.